The Best Barcelona blogs from thousands of top Barcelona blogs in our index using search and social metrics. Data will be refreshed once a week. Also check out Barcelona Youtube Channels. Barcelona newsletter is a comprehensive summary of the day's most important blog posts and news articles from the best Barcelona websites on the web, and delivered to your email inbox each morning. To subscribe, simply provide us with your email address. About Blog FC Barcelona blog with all the latest news, opinion and rumours relating to FC Barcelona. Facebook fans 43,392. Twitter followers 11,555. Barcelona | London | New York City About Blog FC Barcelona news and opinion columns. Home of The Barcelona Podcast. Bringing you the latest breaking Barca stories from the Camp Nou! Facebook fans 694,312. Twitter followers 5,069. Barcelona About Blog Apartments in Barcelona for rent in the best area of the city. ShBarcelona's blog has gathered all the necessary information about Gaudí's town. In addition, you'll discover useful advice and recommendations, whether you stay for a few days or long term in Barcelona.Our blog will satisfy your needs and rapidly inform you about possible activities and Barcelona's daily life. Facebook fans 6,221. Twitter followers 1,526. Facebook fans 5,446. Twitter followers 11,850. Barcelona About Blog Enjoy Barcelona in total comfort.Barcelona Guide Bureau (BGB) is a well-established travel agency that specialises in providing a wide range of fascinating tours in and around Barcelona and Catalonia. Our clear mission is to deliver high quality tour services with professional guides to ensure that the expectations of both our individual clients and travel agent clients are met. Facebook fans 2,077. Twitter followers 2,882. Barcelona About Blog Making people fall in love with Barcelona since 2000. Gaudi Experts. The blog will help people getting a city overview so they can explore Barcelona on their own the rest of their stay, or show them their favorite areas in depth, so they can take the most out of their time here, like them to get a nice mix of history, sites, fun stories and local life, so Barcelona comes alive for them. Facebook fans 464. Twitter followers 662. Barcelona, Spain About Blog SuiteLife has beautiful furnished apartments all over Barcelona for rent and sale. We are a full-service, white glove apartment rental agency that specializes in helping foreigners and locals alike find the home of their dreams.Through our blogs we are constantly creating useful content to help them navigate the city. Facebook fans 2,220. Twitter followers 4,433. Barcelona About Blog Restaurant reviews and recipes in Barcelona. Barcelona food blog by professional restaurant reviewer who's lived in the city for over 20 years. Facebook fans 238. Twitter followers 870. About Blog A Blog dedicated to the Most prestigious Club in the world, FC Barcelona by an ardent fan. All the latest news, events, rumours and pictures from futbol club Barca. Facebook fans 8,211. Twitter followers 3,647. Barcelona, Catalonia About Blog Blog about eating in Barcelona: best restaurants, cool bars, foodie experiences and healthy eating too. Facebook fans 2,979. Twitter followers 1,356. San Francisco, CA About Blog Latest news and dicussion about the FC Barcelona. Facebook fans 567. Twitter followers 521,220. Barcelona, Catalunya, Spain About Blog The best travel guide for your stay in Barcelona! AB Apartment Barcelona has over 1000 fully furnished and equipped apartments to rent for short and long-term stays. Ideal for vacations, business trips or even moving to the city, we have a wide range of Barcelona apartments to choose from in a range of fantastic locations. From sea views apartments to apartments in Eixample and near Las Ramblas. Facebook fans 47,206. Twitter followers 2,041. Barcelona, Spain About Blog Barcinno is the innovation hub for Barcelona’s entrepreneurial and technology communities. As Barcelona’s #1 English-language tech news source, Barcinno spotlights new developments, growing startups, and exciting events, while offering an unparalleled channel for the rapidly growing entrepreneurial community to expand their presence locally as well as internationally. Facebook fans 1,916. Twitter followers 6,772. Barcelona, Spain About Blog totalBarça is a socially responsible organization comprising a team of talented volunteers who are loyal FC Barcelona fans. totalBarca.com mission is to become the ultimate destination for all who have an interest in FC Barcelona. Facebook fans 201,574. Twitter followers 99,603. Barcelona, Spain About Blog WeBarcelona is a travel guide which helps to organize your travel to Barcelona and reserve your accommodation, parking and more. Facebook fans 1,518. Twitter followers 369. Barcelona, Spain About Blog Your Guide to Barcelona's Tech & Startup Scene.One of the first fintech businesses ever has opened a tech center in Barcelona! The site contains all the latest startup and tech events, stories,news and guides in Barcelona. Facebook fans 390. Twitter followers 313. Barcelona About Blog HelloBCN Hostel offers guests an economical alternative to accomodation in Barcelona with breakfast, sheets, internet connection and WIFI, air conditioning, a guest kitchen, a sun terrace and lots of fun... all included in the one low price! Facebook fans 2,789. Twitter followers 2,167. Facebook fans 3,260. Twitter followers 2,133. Barcelona, Spain About Blog Make your vacation comfortable.We are a hostel in Barcelona designed for a small number of guests. Personal treatment and homely and family atmosphere but with a lot of privacy in each of our rooms to ensure the correct rest of our travelers. Facebook fans 1,455. Twitter followers n/a. Barcelona, Catalonia About Blog A Barcelona blog about anything relating to the city of Barcelona.This blog includes Barcelona restaurants, food and many other things related to the beautiful city of Barcelona. Facebook fans 1,411. Twitter followers 2,414. Barcelona About Blog Barcelonaphotoblog.com - A travel blog with attractive images of Barcelona by Carlos Lorenzo - What you should know from the point of view of locals. Facebook fans 1,252. Twitter followers 3,639. BARCELONA, SPAIN About Blog Dedicated to Keeping You Up-to-Date with Barcelona´s non-stop Culinary scene by Curating Best Restaurants, Reviews, Food Festivals, Gourmet Tours, Cooking. Facebook fans 753. Twitter followers 820. Barcelona About Blog The anti tourist guide. Get to know Barcelona like privileged locals.Discover the hottest circuits in town, clandestine restaurants, the secret boutiques, the most sophisticated socialites, the chicest boutique Hotels. Facebook fans 414. Twitter followers 344. Barcelona About Blog We can help you with everything related to your Barcelona wedding, from research and budgeting to design and decoration, setting up and taking it all down. We have agreements with local vendors, accommodation providers, transport and venues in order to make sure you get the best overall price for your event. Barcelona About Blog This blog is about three expat guys going around the the bars of Barcelona, and listing the reviews of each bar. Facebook fans 73. Twitter followers 57. 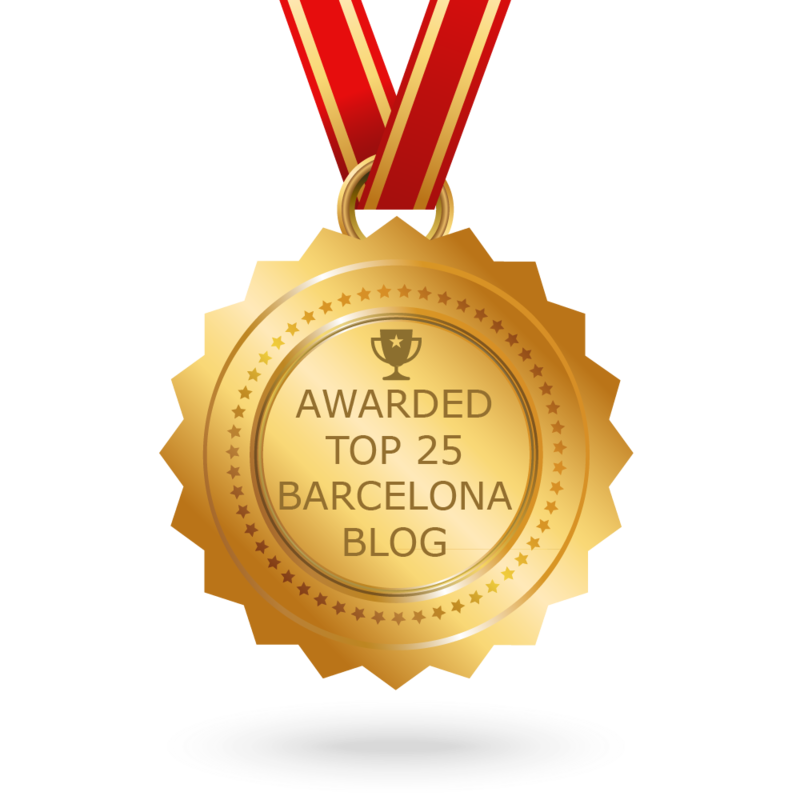 CONGRATULATIONS to every blogger that has made this Top Barcelona Blogs list! This is the most comprehensive list of best Barcelona blogs on the internet and I’m honoured to have you as part of this! I personally give you a high-five and want to thank you for your contribution to this world.